Nitro Cold Brew Coffee is the best way to get your caffeine fix every morning. What's "Nitro cold brew" you say? First you start with our cold brewing process, which extracts a strong, less bitter, less acidic, but very caffeinated coffee from the beans, then we infuse the coffee with 100% nitrogen gas. Why do we do that? (Man you have a lot of questions don't you!) We do this to create a velvety, cascading foam head that is very similar to a stout beer. Unlike carbonation, which adds a harsh popping to the mouth feel like that of a soda, infusing with Nitro adds a subtle creaminess, that elevates the flavors of our unsweetened cold brew coffee. We currently offer our NitroBrew in two forms: our NitroCans, and NitroKegs. A Nitro Keg, in the palm of your hand. Until recently, the only way to fully enjoy the glory of our NitroBrew, was finding an establishment that served our kegs on draft. Since people seemed reluctant to strap a keg on their back ever morning, we decided to release this single serve package of coffee grandeur. Give it a shake, pop the tab, and enjoy the best decision you've made since moving out of your parent's house. We aren't saying it's the best cold brew coffee you can have, but it is. It's like a NitroCan, but like, way bigger. 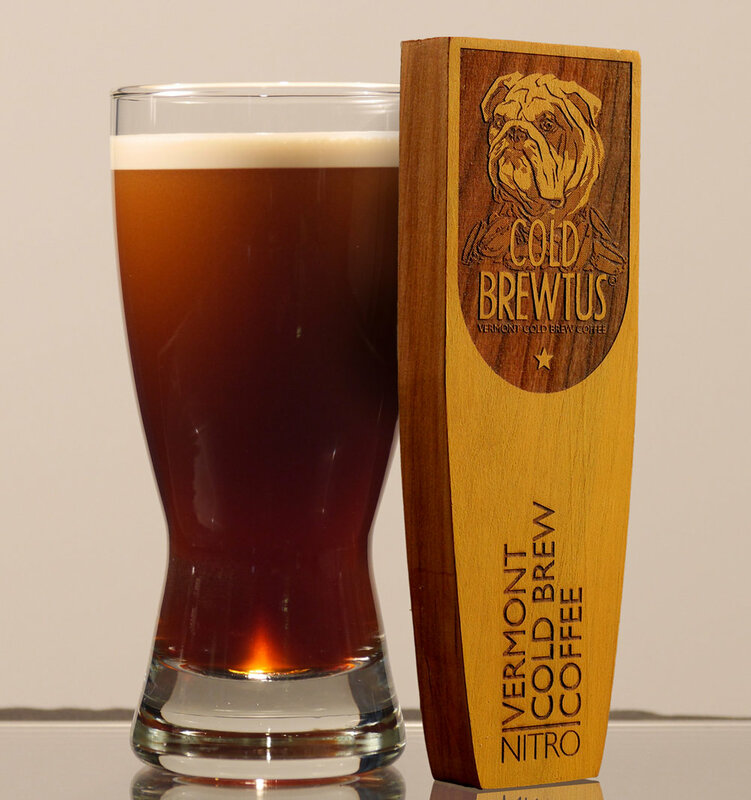 Cold Brewtus started out as a keg first coffee company. We offer our kegs to businesses and restaurants that are serious about getting some caffeine to their employees or consumers. Cold Brewtus kegs can be set up with little effort to most draft lines, and you'll be up and pouring in no time. Our kegs are also fully recyclable so that storing empty kegs is no longer a problem!